The detoxification program at Discovery Institute is designed for people who are just starting to come off of the influence of drugs and alcohol. When people who are addicted to alcohol or drugs stop taking their substance of choice, they experience withdrawal symptoms that are uncomfortable, painful, and can even be fatal in some cases, if detox is not done properly and in a medical environment. At Discovery Institute, we provide a safe medical detox, which ensures that our clients will have the most comfortable detox experience possible. Our detox procedure also ensures that clients’ bodies and brains do not suffer any damage from withdrawal, as we use the most effective medical treatments for alleviating withdrawal symptoms. We assess our clients’ health and medical needs the moment they come through our door to determine any special requirements they may have as they detox from substances. They are under 24/7 medical supervision, and will have access to doctors and therapists at our Discovery Institute detox center in New Jersey. Our staff is trained and experienced in guiding and assisting patients through substance detoxification, and they strive to give all patients the best start on their recovery journey. When a person uses drugs or alcohol regularly and/or in large quantities, their body needs to readjust to functioning without them. Oftentimes, the body and mind become physically dependent upon a substance, and when the patient stops ingesting that substance, the body experiences uncomfortable symptoms of withdrawal. Depending on the substance abused, the length of abuse, and the person’s medical and emotional history, the severity of the detox process will vary. Detox can produce withdrawal symptoms that can be extremely uncomfortable and painful for the patient. This often causes addicts to relapse, because the discomfort of withdrawal is too much to handle. Different substances have different withdrawal symptoms. While all are uncomfortable, some can also be very dangerous. Alcohol and benzodiazepine withdrawal can produce seizures in the patient, and therefore should always be done in a controlled environment, such as a residential detox. Other drugs, like opiates, may not have a fatal withdrawal, but detox in these cases is often so painful and unpleasant that many addicts relapse before the process is complete. That’s why it is most effective to detox from any drug in a medical detox environment, where doctors and nurses can monitor symptoms and prescribe medication and alleviate symptoms and make the process as comfortable as possible. A successful detox is the first step towards long-term recovery. The purpose of our medical detox program is to lessen and prevent many of these scary symptoms. For many patients, fear of withdrawal symptoms is what prevents them from taking the first steps towards recovery and sobriety. Fortunately, at Discovery Institute’s detox center in New Jersey, medical professionals on staff have the knowledge, resources, and medications to help patients through the worst of these symptoms with as little discomfort as possible. Thanks to medical advances, addicts and alcoholics no longer have to suffer through the agony of detox without help and relief. Today, medications and treatments are available to help patients begin their recovery journey with the best chance of success. Medical detox is a process of clearing the body of all mood-altering substances, such as drugs and alcohol, and it begins the moment a client comes to our facility. 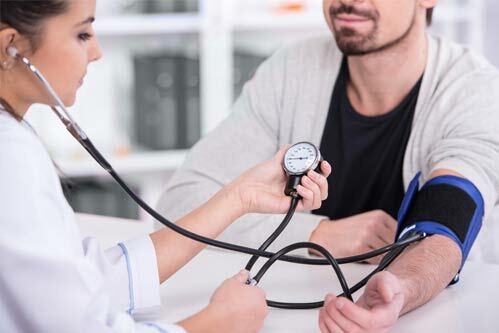 After we assess the patient to determine what kinds of drugs or alcohol they were using, a complete medical exam is done to assess the client’s overall health and to identify and rule out any underlying medical issues that may be worsening or complicating their symptoms. Oftentimes, addicts and alcoholics suffer from medical issues that may or may not be related to their addiction, and we are dedicated to attending to these issues as well. Patients will fill out comprehensive assessment forms that detail their medical and social history. These assessments also help our staff to determine which drugs they were using and how frequently they were using them. This information is important because it dictates which detox medications are appropriate for the patient. One of our intake professionals will conduct this assessment and collect all of the necessary information so that our staff can create an effective treatment plan. This information helps our dedicated doctors and nurses decide on an appropriate regimen of medicine, rest, and nutrition to make the client as comfortable as possible. In addition to the appropriate medications, our facility offers comfortable beds and nutritious, regular meals to help patients’ bodies regain strength and optimum health. We use a variety of measures to monitor vital signs, physical health, and emotional stability throughout the detoxification process. At our detox center in New Jersey, we monitor clients in the medical detox program at all hours of the day and night in the case of complications. A trained, licensed staff member is always available to patients to help make their stay as comfortable and as safe as possible. Acute detox can last anywhere from a couple of days to a week or more, depending on the patient’s medical status and the severity of their addiction. We keep a close eye on each patient to determine when they are ready to move out of detox and into regular treatment. Detoxing is an important first step towards recovery. In order to have the best experience in treatment, patients must be free and clear of all mood and mind altering substances. At Discovery, we strive to make that process as smooth as possible, and our world-class staff is there to help patients navigate the journey every step of the way.